A first-rate second installment for this sequelilogy! Branderson strikes (gold) again! Sanderson, Brandon. Shadows of Self. Tor: 2015. What is a sequelilogy, you ask? Simple: it’s a sequel trilogy, of which this is the second volume. I’m getting a massive tsunami of déjà vu writing this, so perhaps I’ve already coined a new term for this phenomenon, but if so, I doubt it can hold a candle to the brilliance of sequelilogy, am I right? 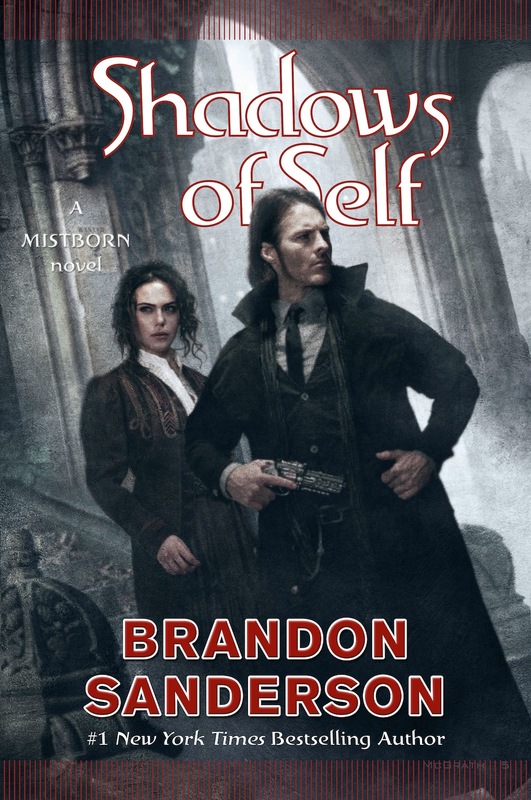 Anyway, the original Mistborn trilogy by Brandon “Branderson” Sanderson was fantastic, so any sequel effort was bound to feel a little underwhelming. Sure enough, Alloy of Law, the first in the new series, evidently conceived as more of a one-off at first than the start of a new trilogy, left me intrigued but somewhat unmoved. Wax and the others, especially Wayne, were compelling enough as characters go, and Branderson’s interesting mixing of near-modern technology with allomancy and other essentially magical arts was spellbinding. But overall, something just felt a bit lacking. This led to slightly reduced expectations on my part for Shadows of Self, which I knew to be a continuation of the Wax storyline. Surely there was no way Branderson could continue a story already palpably less awesome than Vin’s and somehow raise his game? My oh my, was I wrong! Like Empire Strikes Back (though emphatically not SW 2, Clone Wars!) before it, the middle volume of the sequelilogy delivers the emotional punch, and a more cosmic sense of crisis (and mystery), than the initial installment. I would still rate Vin’s story as superior, but Wax’s emotional journey in this volume is certainly nothing to sneeze at, and the stakes are much higher than merely a tough-to-kill baddie and a cabalistic business conspiracy (a la Alloy of Law). Heck, even the title ‘Shadows of Self’ is oodles better than Alloy of Law. All in all, Branderson has given us an excellent ride in this volume, and raised expectations considerably for the concluding installment in the sequelilogy, due out later this month. Here’s hoping you deliver, Branderson! This review brought to you by Zhaoyun, would-be Allomancer and actual NOAF reviewer since 2013.